Armed with just my iPhone, I couldn't exactly do justice to some of the magic that lay within. But you get the picture right? Non sponsored. All opinions are mine and mine alone. 1. The PotLuck Club : Tucked away in the Old Biscuit Mill in the Woodstock district, this creative yet casual dining spot has hearts fluttering in South Africa. So, following a tedious reservation process (they are booked months in advance!) I cleared my calendar for the only day they could offer and began my "excited-to-try-this-restaurant" preps. These preps are rather extensive, and usually include talking about it non-stop, stalking reviews and news online, salivating at the menu options, running a few miles on the day, skipping breakfast, and then worrying that I might have built it up too much in my head. But it was worth every thought. With a selection of Tapas to choose from, split by taste - Salty, Sweet, Bitter, Sour & Umami, we were advised to select around 6-7 plates spanning the 5 genres. And so we did. My favourites were the special Roasted Celeriac Salad w/ Sesame Paste & Mint Pesto and the Jerk Chicken w/ Bean Puree & Corn on the Cob (ate it faster than I could take a picture). Others included a Sashimi & Heirloom Tomato Salad, Mini Fish Tacos, Beer Battered Fish w/ Cardamom Mayo, Duck Breast with Yuzu Dressing. The only thing I didn't wow about, just because the food was incredibly good, were the desserts. We tried the Hot Chocolate Pot and the Sweet Bunny Chow (loved the idea though!) They are probably good, but the small plates created a bar that, unfortunately, the sweet ending couldn't reach up to. Overall, each plate was not only beautifully plated, but boasted unique flavours which made each bite a surprise. And yet, there was a sophisticated simplicity to it all. So, if you find yourself in Cape Town, plan in advance, grab whatever seating they have available and give this one a go. You will not be disappointed. Oh, and while there make sure you visit the restrooms. The view is pretty darn incredible. 2. Chefs Warehouse - In the buzzing Bree Street, this little shop + canteen of unique chef ware churns out simple, comforting tapas that change daily. Meant to be shared, you can order all 8 on the menu or share 4. We tried the Onion Risotto, Fried Calamari w/ Avocado, Squash Ravioli, and one more that I just can't remember! Wash it down with their selection of wines, stroll around their shop for (slightly expensive) but artisan culinary serve ware/dishes, spices & condiments, and just enjoy the experience of dining inside a shop. 3. Espresso Lab & Deluxe Coffeeworks - Living in New York makes you somewhat of a coffee snob. Truth be told, there is no amazing coffee in SA. 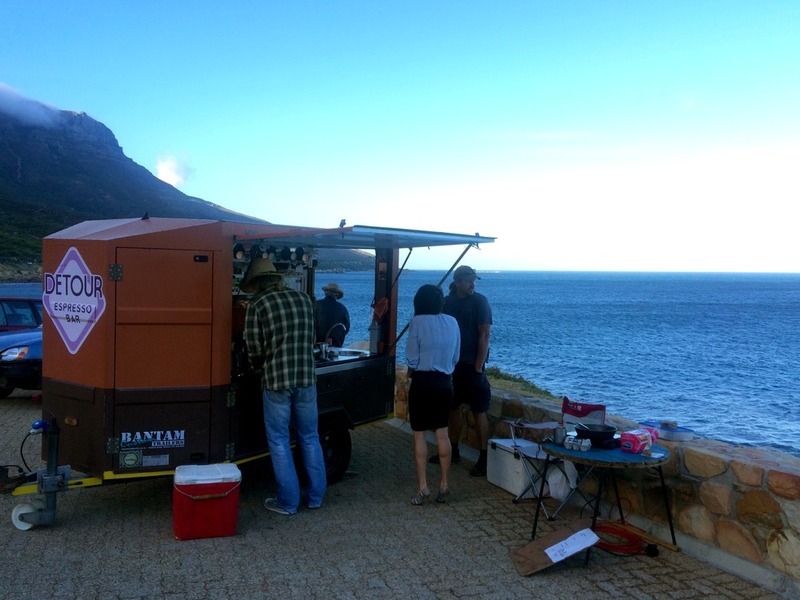 However, these little spots are definitely trying to create a niche in the coffee business and working on introducing to Cape-Tonians (and South Africans in general) the art of good gourmet coffee. Because no folks, Mugg & Bean is not coffee. 4. Detour Espresso Bar - My most prized find in SA by far! Marck's story is not only unique, interesting and inspiring, but he creates some pretty darn good cuppas from his little coffee cart. 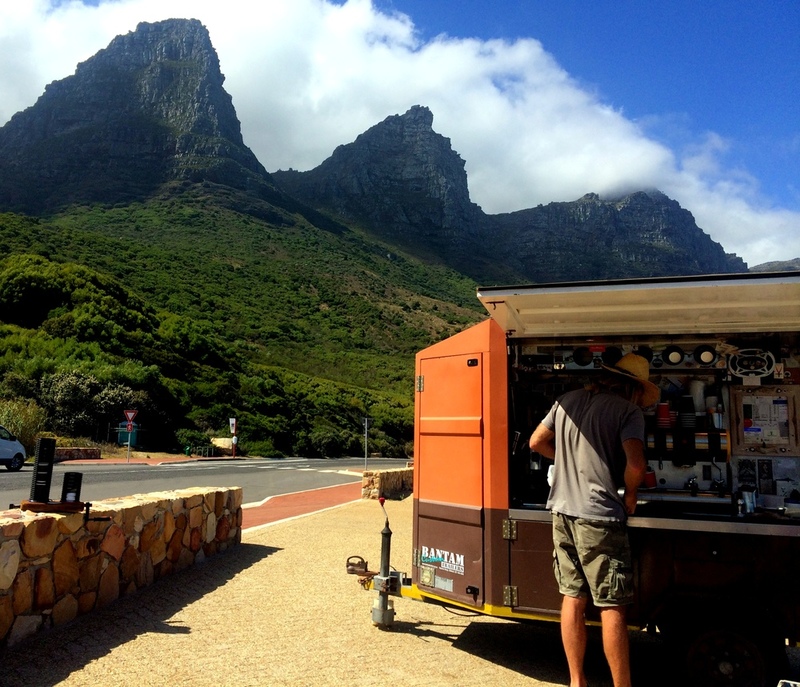 Embraced by mountains on one side, and the ocean on another, he is a local hero for many morning commuters who stop by for their morning fix, or even just to say hello. We ran into him (literally) during our morning run, and had to give it a try! 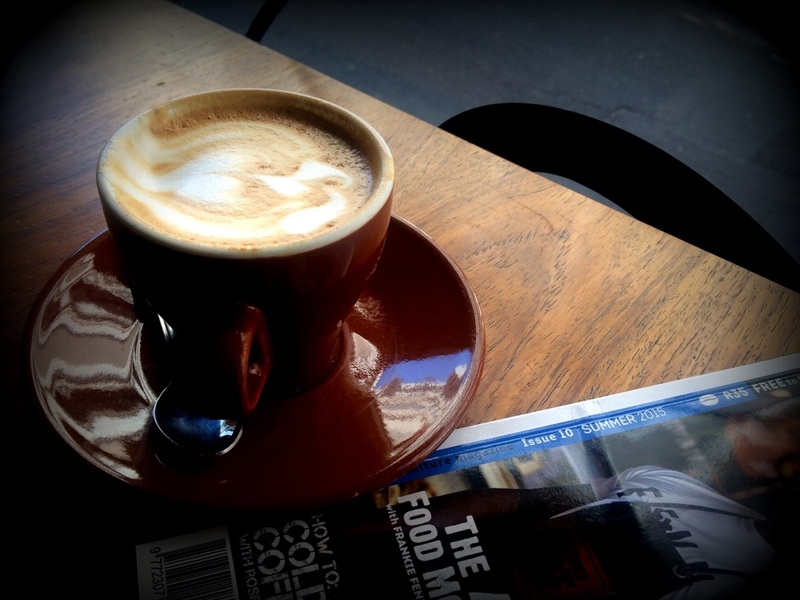 Creamy Flat Whites for $1 and plenty of smiles & warmth in the middle of nowhere? Yes pls! I am certain this is what heaven is like.